"Accident and Emergency", "Emergency room", and "Emergency ward" redirect here. For other uses, see Accident and Emergency (disambiguation), Emergency room (disambiguation), and Emergency ward (disambiguation). Today, a typical hospital has its emergency department in its own section of the ground floor of the grounds, with its own dedicated entrance. As patients can present at any time and with any complaint, a key part of the operation of an emergency department is the prioritization of cases based on clinical need. This process is called triage. Triage is normally the first stage the patient passes through, and consists of a brief assessment, including a set of vital signs, and the assignment of a "chief complaint" (e.g. chest pain, abdominal pain, difficulty breathing, etc.). Most emergency departments have a dedicated area for this process to take place, and may have staff dedicated to performing nothing but a triage role. In most departments, this role is fulfilled by a triage nurse, although dependent on training levels in the country and area, other health care professionals may perform the triage sorting, including paramedics or physicians. Triage is typically conducted face-to-face when the patient presents, or a form of triage may be conducted via radio with an ambulance crew; in this method, the paramedics will call the hospital's triage center with a short update about an incoming patient, who will then be triaged to the appropriate level of care. The resuscitation area, commonly referred to as "Trauma" or "Resus", is a key area in most departments. The most seriously ill or injured patients will be dealt with in this area, as it contains the equipment and staff required for dealing with immediately life-threatening illnesses and injuries. Typical resuscitation staffing involves at least one attending physician, and at least one and usually two nurses with trauma and Advanced Cardiac Life Support training. These personnel may be assigned to the resuscitation area for the entirety of the shift, or may be "on call" for resuscitation coverage (i.e. if a critical case presents via walk-in triage or ambulance, the team will be paged to the resuscitation area to deal with the case immediately). Resuscitation cases may also be attended by residents, radiographers, ambulance personnel, respiratory therapists, hospital pharmacists and/or students of any of these professions depending upon the skill mix needed for any given case and whether or not the hospital provides teaching services. Patients whose condition is not immediately life-threatening will be sent to an area suitable to deal with them, and these areas might typically be termed as a prompt care or minors area. Such patients may still have been found to have significant problems, including fractures, dislocations, and lacerations requiring suturing. Fast decisions on life-and-death cases are critical in hospital emergency departments. As a result, doctors face great pressures to overtest and overtreat. The fear of missing something often leads to extra blood tests and imaging scans for what may be harmless chest pains, run-of-the-mill head bumps, and non-threatening stomach aches, with a high cost on the health care system. Emergency department became commonly used when emergency medicine was recognised as a medical specialty, and hospitals and medical centres developed departments of emergency medicine to provide services. Other common variations include 'emergency ward,' 'emergency centre' or 'emergency unit'. 'Accident and Emergency' or 'A&E' is still the accepted term in the United Kingdom, some Commonwealth countries, and the Republic of Ireland, as are earlier terms such as 'Casualty' or 'casualty ward', which continue to be used informally. The same applies to 'emergency room' or 'ER' in North America, originating when emergency facilities were provided in a single room of the hospital by the department of surgery. In some countries, including the United States and Canada, a smaller facility that may provide assistance in medical emergencies is known as a clinic. Larger communities often have walk-in clinics where people with medical problems that would not be considered serious enough to warrant an emergency department visit can be seen. These clinics often do not operate on a 24-hour basis. Very large clinics may operate as "free-standing emergency centres," which are open 24 hours and can manage a very large number of conditions. However, if a patient presents to a free-standing clinic with a condition requiring hospital admission, he or she must be transferred to an actual hospital, as these facilities do not have the capability to provide inpatient care. Mayo Clinic Hospital in Rochester. Trilingual signage in French, Dutch and English at an emergency department in Brussels, Belgium. The Centers for Medicare and Medicaid Services (CMS) classified emergency departments into two types: Type A, the majority, which are open 24 hours a day, 7 days a week, 365 days a year; and those who are not, Type B. Many US emergency departments are exceedingly busy. A study found that in 2009, there were an estimated 128,885,040 ED encounters in US hospitals. Approximately one-fifth of ED visits in 2010 were for patients under the age of 18 years. In 2009–2010, a total of 19.6 million emergency department visits in the United States were made by persons aged 65 and over. Most encounters (82.8 percent) resulted in treatment and release; 17.2 percent were admitted to inpatient care. The 1986 Emergency Medical Treatment and Active Labor Act is an act of the United States Congress, that requires emergency departments, if the associated hospital receives payments from Medicare, to provide appropriate medical examination and emergency treatment to all individuals seeking treatment for a medical condition, regardless of citizenship, legal status, or ability to pay. Like an unfunded mandate, there are no reimbursement provisions. Rates of ED visits rose between 2006 and 2011 for almost every patient characteristic and location. The total rate of ED visits increased 4.5% in that time. However, the rate of visits for patients under one year of age declined 8.3%. One inspection of Los Angeles area hospitals by Congressional staff found the EDs operating at an average of 116% of capacity (meaning there were more patients than available treatment spaces) with insufficient beds to accommodate victims of a terrorist attack the size of the 2004 Madrid train bombings. Three of the five Level I trauma centres were on "diversion", meaning ambulances with all but the most severely injured patients were being directed elsewhere because the ED could not safely accommodate any more patients. This controversial practice was banned in Massachusetts (except for major incidents, such as a fire in the ED), effective 1 January 2009; in response, hospitals have devoted more staff to the ED at peak times and moved some elective procedures to non-peak times. In 2009, there were 1,800 EDs in the country. In 2011, about 421 out of every 1,000 people in the United States visited the emergency department; five times as many were discharged as were admitted. Rural areas are the highest rate of ED visits (502 per 1,000 population) and large metro counties had the lowest (319 visits per 1,000 population). By region, the Midwest had the highest rate of ED visits (460 per 1,000 population) and Western States had the lowest (321 visits per 1,000 population). In addition to the normal hospital based emergency departments a trend has developed in some states (including Texas and Colorado) of emergency departments not attached to hospitals. These new emergency departments are referred to as free standing emergency departments. The rationale for these operations is the ability to operate outside of hospital policies that may lead to increased wait times and reduced patient satisfaction. A&E sign common in the UK. Historically, waits for assessment in A&E were very long in some areas of the UK. 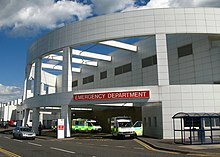 In October 2002, the Department of Health introduced a four-hour target in emergency departments that required departments in England to assess and treat patients within four hours of arrival, with referral and assessment by other departments if deemed necessary. It was expected that the patients would have physically left the department within the four hours. Present policy is that 95% of all patient cases do not "breach" this four-hour wait. The busiest departments in the UK outside London include University Hospital of Wales in Cardiff, The North Wales Regional Hospital in Wrexham, the Royal Infirmary of Edinburgh and Queen Alexandra Hospital in Portsmouth. In July 2014, the QualityWatch research programme published in-depth analysis which tracked 41 million A&E attendances from 2010 to 2013. This showed that the number of patients in a department at any one time was closely linked to waiting times, and that crowding in A&E had increased as a result of a growing and ageing population, compounded by the freezing or reduction of A&E capacity. Between 2010/11 and 2012/13 crowding increased by 8%, despite a rise of just 3% in A&E visits, and this trend looks set to continue. Other influential factors identified by the report included temperature (with both hotter and colder weather pushing up A&E visits), staffing and inpatient bed numbers. A&E services in the UK are often the focus of a great deal of media and political interest, and data on A&E performance is published weekly. However, this is only one part of a complex urgent and emergency care system. Reducing A&E waiting times therefore requires a comprehensive, coordinated strategy across a range of related services. Many A&E departments are crowded and confusing. Many of those attending are understandably anxious, and some are mentally ill, and especially at night are under the influence of alcohol or other substances. Pearson Lloyd's redesign – 'A Better A&E' – is claimed to have reduced aggression against hospital staff in the departments by 50 per cent. A system of environmental signage provides location-specific information for patients. Screens provide live information about how many cases are being handled and the current status of the A&E department. Waiting times for patients to be seen at A&E have been rising. Cardiac arrest may occur in the ED/A&E or a patient may be transported by ambulance to the emergency department already in this state. Treatment is basic life support and advanced life support as taught in advanced life support and advanced cardiac life support courses. Patients arriving to the emergency department with a myocardial infarction (heart attack) are likely to be triaged to the resuscitation area. They will receive oxygen and monitoring and have an early ECG; aspirin will be given if not contraindicated or not already administered by the ambulance team; morphine or diamorphine will be given for pain; sub lingual (under the tongue) or buccal (between cheek and upper gum) glyceryl trinitrate (nitroglycerin) (GTN or NTG) will be given, unless contraindicated by the presence of other drugs. An ECG that reveals ST segment elevation suggests complete blockage of one of the main coronary arteries. These patients require immediate reperfusion (re-opening) of the occluded vessel. This can be achieved in two ways: thrombolysis (clot-busting medication) or percutaneous transluminal coronary angioplasty (PTCA). Both of these are effective in reducing significantly the mortality of myocardial infarction. Many centers are now moving to the use of PTCA as it is somewhat more effective than thrombolysis if it can be administered early. This may involve transfer to a nearby facility with facilities for angioplasty. Major trauma, the term for patients with multiple injuries, often from a motor vehicle crash or a major fall, is initially handled in the Emergency Department. However, trauma is a separate (surgical) specialty from emergency medicine (which is itself a medical specialty, and has certifications in the United States from the American Board of Emergency Medicine). The services that are provided in an emergency department can range from x-rays and the setting of broken bones to those of a full-scale trauma centre. A patient's chance of survival is greatly improved if the patient receives definitive treatment (i.e. surgery or reperfusion) within one hour of an accident (such as a car accident) or onset of acute illness (such as a heart attack). This critical time frame is commonly known as the "golden hour". Some patients arrive at an emergency department for a complaint of mental illness. In many jurisdictions (including many US states), patients who appear to be mentally ill and to present a danger to themselves or others may be brought against their will to an emergency department by law enforcement officers for psychiatric examination. The emergency department conducts medical clearance rather than treats acute behavioral disorders. From the emergency department, patients with significant mental illness may be transferred to a psychiatric unit (in many cases involuntarily). Cardiac arrest and major trauma are relatively common in EDs, so defibrillators, automatic ventilation and CPR machines, and bleeding control dressings are used heavily. Survival in such cases is greatly enhanced by shortening the wait for key interventions, and in recent years some of this specialized equipment has spread to pre-hospital settings. The best-known example is defibrillators, which spread first to ambulances, then in an automatic version to police cars and fire apparatus, and most recently to public spaces such as airports, office buildings, hotels, and even shopping malls. Because time is such an essential factor in emergency treatment, EDs typically have their own diagnostic equipment to avoid waiting for equipment installed elsewhere in the hospital. Nearly all have radiographic examination rooms staffed by dedicated Radiographer, and many now have full radiology facilities including CT scanners and ultrasonography equipment. Laboratory services may be handled on a priority basis by the hospital lab, or the ED may have its own "STAT Lab" for basic labs (blood counts, blood typing, toxicology screens, etc.) that must be returned very rapidly. Metrics applicable to the ED can be grouped into three main categories, volume, cycle time, and patient satisfaction. Volume metrics including arrivals per hour, percentage of ED beds occupied and age of patients are understood at a basic level at all hospitals as an indication for staffing requirements. Cycle time metrics are the mainstays of the evaluation and tracking of process efficiency and are less widespread since an active effort is needed to collect and analyze this data. Patient satisfaction metrics, already commonly collected by nursing groups, physician groups and hospitals, are useful in demonstrating the impact of changes in patient perception of care over time. Since patient satisfaction metrics are derivative and subjective, they are less useful in primary process improvement. Health information exchanges can reduce nonurgent ED visits by supplying current data about admissions, discharges, and transfers to health plans and accountable care organizations, allowing them to shift ED use to primary care settings. In all Primary Care Trusts there are out of hours medical consultations provided by general practitioners or nurse practitioners. In the United States, high costs are incurred by non-emergency use of the emergency room. The National Hospital Ambulatory Medical Care Survey looked ath the ten most common symptoms for which giving rise to emergency room visits (cough, sore throat, back pain, fever, headache, abdominal pain, chest pain, other pain, shortness of breath, vomiting) and made suggestions as to which would be the most cost-effective choice among virtual care, retail clinic, urgent care or emergency room. Notably, certain complaints may also be addressed by a telephone call to a person's primary care provider. In the United States, and many other countries, hospitals are beginning to create areas in their emergency rooms for people with minor injuries. These are commonly referred as Fast Track or Minor Care units. These units are for people with non-life-threatening injuries. The use of these units within a department have been shown to significantly improve the flow of patients through a department and to reduce waiting times. Urgent care clinics are another alternative, where patients can go to receive immediate care for non-life-threatening conditions. To reduce the strain on limited ED resources, American Medical Response created a checklist that allows EMTs to identify intoxicated individuals who can be safely sent to detoxification facilities instead. Emergency department overcrowding is when function of a department is hindered by an inability to treat all patients in an adequate manner. This is a common occurrence in emergency departments worldwide. Overcrowding causes inadequate patient care which leads to poorer patient outcomes. To address this problem, escalation policies are used by emergency departments when responding to an increase in demand (e.g., a sudden inflow of patients) or a reduction in capacity (e.g., a lack of beds to admit patients). The policies aim to maintain the ability to deliver patient care, without compromising safety, by modifying ‘normal’ processes. Emergency department (ED) waiting times have a serious impact on patient mortality, morbidity with readmission in less than 30 days, length of stay, and patient satisfaction. A review of the literature bears out the logical premise that since the outcome of treatment for all diseases and injuries is time-sensitive, the sooner treatment is rendered, the better the outcome. Various studies reported significant associations between waiting times and higher mortality and morbidity among those who survived. It is clear from the literature that untimely hospital deaths and morbidity can be reduced by reductions in ED waiting times. While a significant proportion of people attending emergency departments are discharged home after treatment, many require admission for ongoing observation or treatment, or to ensure adequate social care before discharge is possible. If people requiring admission are not able to be moved to inpatient beds swiftly, "exit block" or "access block" occurs. This often leads to crowding and impairs flow to the point that it can lead to delays in appropriate treatment for newly presenting cases ("arrival access block"). This phenomenon is more common in densely populated areas, and affects pediatric departments less than adults ones. Exit block can lead to delays in care both in the people awaiting inpatient beds ("boarding") and those who newly present to an exit blocked department. Various solutions have been proposed, such as changes in staffing or increasing inpatient capacity. Frequent presenters are persons who will present themselves at a hospital multiple times, usually those with complex medical requirements or with psychological issues complicating medical management. These persons contribute to overcrowding and typically require more hospital resources although they do not account for a significant number of visits. To help prevent inappropriate emergency department use and return visits, some hospitals offer care coordination and support services such as at-home and in-shelter transitional primary care for frequent presenters and short-term housing for homeless patients recovering after discharge. Emergency departments in the military benefit from the added support of enlisted personnel who are capable of performing a wide variety of tasks they have been trained for through specialized military schooling. For example, in United States Military Hospitals, Air Force Aerospace Medical Technicians and Navy Hospital Corpsmen perform tasks that fall under the scope of practice of both doctors (i.e. sutures, staples and incision and drainages) and nurses (i.e. medication administration, foley catheter insertion, and obtaining intravenous access) and also perform splinting of injured extremities, nasogastric tube insertion, intubation, wound cauterizing, eye irrigation, and much more. Often, some civilian education and/or certification will be required such as an EMT certification, in case of the need to provide care outside the base where the member is stationed. The presence of highly trained enlisted personnel in an Emergency Departments drastically reduces the workload on nurses and doctors. According to a survey at an urban inner-city tertiary care centre in Vancouver, 57% of health care workers were physically assaulted in 1996. 73% were afraid of patients as a result of violence, almost half, 49%, hid their identities from patients, 74% had reduced job satisfaction. Over one-quarter of the respondents took days off because of violence. Of respondents no longer working in the emergency department, 67% reported that they had left the job at least partly owing to violence. Twenty-four-hour security and a workshop on violence prevention strategies were felt to be the most useful potential interventions. Physical exercise, sleep and the company of family and friends were the most frequent coping strategies cited by those surveyed. Medication errors are issues that lead to incorrect medication distribution or potential for patient harm. As of 2014, around 3% of all hospital-related adverse effects were due to medication errors in the emergency department (ED); between 4% and 14% of medications given to patients in the ED were incorrect and children were particularly at risk. Errors can arise if the doctor prescribes the wrong medication, if the prescription intended by the doctor is not the one actually communicated to the pharmacy due to an illegibly-written prescription or misheard verbal order, if the pharmacy dispenses the wrong medication, or if the medication is then given to the wrong person. The ED is a riskier environment than other areas of the hospital due to medical practitioners not knowing the patient as well as they know longer term hospital patients, due to time pressure caused by overcrowding, and due to the emergency-driven nature of the medicine that is practiced there. ^ The Lancet. J. Onwhyn. 24 January 2018 – via Google Books. ^ A Reference handbook of the medical sciences embracing the entire range of scientific and practical medicine and allied science. W. Wood. 24 January 2018 – via Google Books. ^ "A&E departments". NHS Choices. NHS. Retrieved 2 February 2015. ^ Title 22, California Code of Regulations, Section 70453(j). ^ Emergency Department Visits by Persons Aged 65 and Over: United States, 2009–2010. Hyattsville, Md. : U.S. Department of Health and Human Services, Centers for Disease Control and Prevention, National Center for Health Statistics, 2013. ^ "ER Wait Time Problems Widespread". abcnews.go.com. ^ Kowalczyk, Liz (13 September 2008). "State orders hospital ERs to halt 'diversions'". The Boston Globe. ^ Kowalczyk, Liz (24 December 2008). "Hospitals shorten the waits in ERs". The Boston Globe. ^ Gresser, Joseph (18 November 2009). "NC president found hospital a "pleasant surprise"". Barton, Vermont: the Chronicle. p. 21. ^ a b c Weiss AJ, Wier LM, Stocks C, Blanchard J (June 2014). "Overview of Emergency Department Visits in the United States, 2011". HCUP Statistical Brief #174. Rockville, MD: Agency for Healthcare Research and Quality. ^ "What's going on in A&E? The key questions answered". King's Fund. 6 March 2017. Retrieved 19 March 2017. ^ Blunt, Ian. "Focus on: A&E attendances". QualityWatch. Nuffield Trust & Health Foundation. Retrieved 2 February 2015. ^ "NHS Winter 2014–15: Weekly A&E tracker". BBC News. Retrieved 2 February 2015. ^ "An alternative guide to the urgent and emergency care system in England". The King's Fund. Retrieved 2 February 2015. ^ "A&E department redesign 'cuts aggression by half'". Design Week. 28 November 2013. Retrieved 13 December 2013. ^ "Statewide Health Information Exchange Provides Daily Alerts About Emergency Department and Inpatient Visits, Helping Health Plans and Accountable Care Organizations Reduce Utilization and Costs". Agency for Healthcare Research and Quality. 29 January 2014. Retrieved 29 January 2014. ^ Richard Klasco, Richard Zane (6 September 2018). "How to (Maybe) Avoid Sticker Shock at the Emergency Room". New York Times. Retrieved 6 September 2018. ^ "Emergency Medical Technicians Use Checklist To Identify Intoxicated Individuals who Can Safely Go to Detoxification Facility Rather Than Emergency Department". Agency for Healthcare Research and Quality. 13 March 2013. Retrieved 10 May 2013. ^ a b Aacharya RP, Gastmans C, Denier Y (2011). "Emergency department triage: an ethical analysis". BMC Emergency Medicine. 11: 16. doi:10.1186/1471-227X-11-16. PMC 3199257. PMID 21982119. ^ Trzeciak S, Rivers EP (September 2003). "Emergency department overcrowding in the United States: an emerging threat to patient safety and public health". Emergency Medicine Journal. 20 (5): 402–05. doi:10.1136/emj.20.5.402. PMC 1726173. PMID 12954674. Retrieved 9 December 2011. ^ Back, Jonathan; Ross, Alastair J.; Duncan, Myanna D.; Jaye, Peter; Henderson, Katherine; Anderson, Janet E. (2017). "Emergency Department Escalation in Theory and Practice: A Mixed-Methods Study Using a Model of Organizational Resilience". Annals of Emergency Medicine. 70 (5): 659–671. doi:10.1016/j.annemergmed.2017.04.032. ISSN 0196-0644. PMID 28662909. ^ Guttmann, A.; Schull, M. J.; Vermeulen, M. J. & Stukel, T. A. (2013). "The relationship between emergency department crowding and patient outcomes: A systematic review". Journal of Nursing Scholarship. ^ "Ontario's emergency room waiting time strategy". Ontario Ministry of Health and Long Term Care (2008). Retrieved 15 August 2015. ^ Carter E. J.; Pouch, S. M. & Larson, E. L. (1 June 2011). "Association between waiting times and short term mortality and hospital admission after departure from emergency department: population based cohort study from Ontario, Canada". BMJ. 342: d2983. doi:10.1136/bmj.d2983. PMC 3106148. PMID 21632665. ^ Thomas A. Sharon (7 September 2015). "Shortening Emergency Department Waiting Times through Evidenced-Based Practice". Locatible Health Tech Hub. Retrieved 7 September 2015. ^ a b c Mason, Suzanne; Knowles, Emma; Boyle, Adrian (January 2017). "Exit block in emergency departments: a rapid evidence review" (PDF). Emergency Medicine Journal. 34 (1): 46–51. doi:10.1136/emermed-2015-205201. PMID 27789568. ^ Markham D, Graudins A (2011). "Characteristics of frequent emergency department presenters to an Australian emergency medicine network". BMC Emergency Medicine. 11: 21. doi:10.1186/1471-227X-11-21. PMC 3267650. PMID 22171720. ^ Mandelberg JH, Kuhn RE, Kohn MA (June 2000). "Epidemiologic analysis of an urban, public emergency department's frequent users". Academic Emergency Medicine. 7 (6): 637–46. doi:10.1111/j.1553-2712.2000.tb02037.x. PMID 10905642. ^ "Provider Team Offers Services and Referrals to Frequent Emergency Department Users in Inner City, Leading to Anecdotal Reports of Lower Utilization". Agency for Healthcare Research and Quality. 27 May 2013. Retrieved 17 October 2013. ^ "Short-Term Housing and Care for Homeless Individuals After Discharge Leads to Improvements in Medical and Housing Status, Fewer Emergency Department Visits, and Significant Cost Savings". Agency for Healthcare Research and Quality. 23 October 2013. Retrieved 23 October 2013. ^ a b Fernandes CM, Bouthillette F, Raboud JM, et al. (November 1999). "Violence in the emergency department: a survey of health care workers". CMAJ. 161 (10): 1245–48. PMC 1230785. PMID 10584084. ^ Research, Center for Drug Evaluation and. "Medication Errors Related to Drugs". www.fda.gov. Retrieved 2018-02-22. ^ a b Weant KA, Bailey AM, Baker SN (2014-07-23). "Strategies for reducing medication errors in the emergency department". Open Access Emergency Medicine. 6: 45–55. doi:10.2147/OAEM.S64174. PMC 4753984. PMID 27147879. ^ Trzeciak S, Rivers EP (September 2003). "Emergency department overcrowding in the United States: an emerging threat to patient safety and public health". Emergency Medicine Journal. 20 (5): 402–5. doi:10.1136/emj.20.5.402. PMC 1726173. PMID 12954674. Wikimedia Commons has media related to Emergency departments. Wait Time for Treatment in Hospital Emergency Departments, 2009. Hyattsville, Md. : U.S. Department of Health and Human Services, Centers for Disease Control and Prevention, National Center for Health Statistics, 2012.